Over a year ago I used Delta’s Book of War to resolve a major battle taking place in my campaign: the Battle of Restenford. Next weekend I’ll be doing it again, and for this one the author himself is coming up to help me run it. Expect to see more details on that in the future. I invited some of the players to come and control the defense, which they’re excited to do, but a bit nervous about facing off against the creator of the game. 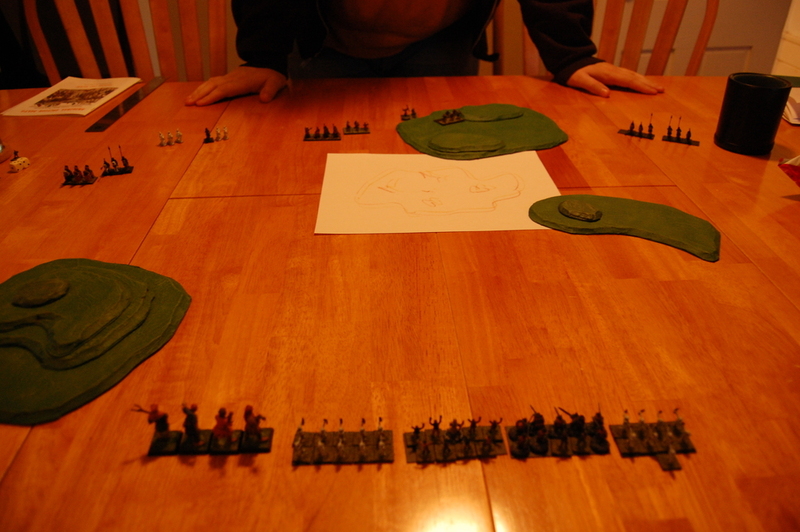 Some practice games were proposed, and so this afternoon I had two guest over for a little Book of War action. Two players showed up, and for the first game I had them play just using the basic rules, 200 points a piece, just to get a feel for the rules. We actually made a fair number of mistakes along the way, and I took pretty poor pictures of it, so we’ll just skip the review of that game. 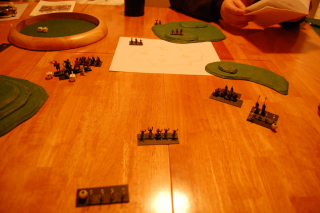 The major point of interest was that it ended with one player down to just one unit of three horse archers, while the other had two units of cavalry, one medium and one heavy. It was turning into a very slow game of cat and mouse, and so the horse archer player decided to just concede. I think with two units the other guy probably could have eventually cornered those darned horse archers, though it would have taken quite a few turns. My forces in the fore-ground from left to right include: 4 hill giants, 10 goblin archers (cleverly disguised as skeletons), 9 medium orc infantry with an embedded rank-2 wizard, 10 more orc medium infantry, and finally 10 more goblin archers (again disguised as skeletons). For my spell I took Control Weather in hopes of avoiding bright sun penalties on all the green skins, but the weather roll came up cloudy anyway. Still, worth the extra points I thought to ensure dark skies. My opponents’ forces from left to right include: 3 horse archers, 3 light cavalry, 3 heavy cavalry, another 3 heavy cavalry, 8 pikemen, 5 archers, a wizard with 3 heavy infantry entourage, 5 more archers, 3 medium cavalry, and finally 3 more medium cavalry. Yeah, that’s a lot of little units, which I’m not sure was an intentional strategy, but it did work in their favor as we will see. The terrain includes a section of rough in the middle surrounded by lots of hills. Amusingly most of those terrain placements are my own, as my opponents kept rolling “open”. They seemed disappointed by not getting to place terrain, but for an army with so many cavalry I think they should be pretty pleased. I’ve moved all my green skins forward slightly in a defensive posture around the wizard and to try and get into better range weapon firing position, though the right flank opponents remain well out of range. On the far left some lucky rock throwing has killed one horse archer and routed the unit, which will vanish off the board next round. Excellent result considering the -2 to their rolls due to range and indirect fire over the hills. One of the heavy cavalry units has also lost a model from my wizard’s fireball wand, though no route there. Above is the end of my opponents’ round 2. The enemy horse archers are nearly off the board. On the right the medium cavalry have pushed forward but were slowed a bit by the intervening hills. 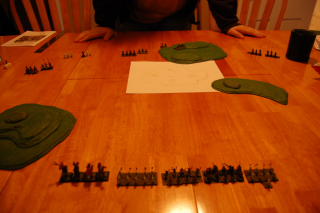 My right-most unit of orc infantry have taken some losses from archer fire, but hold the line. 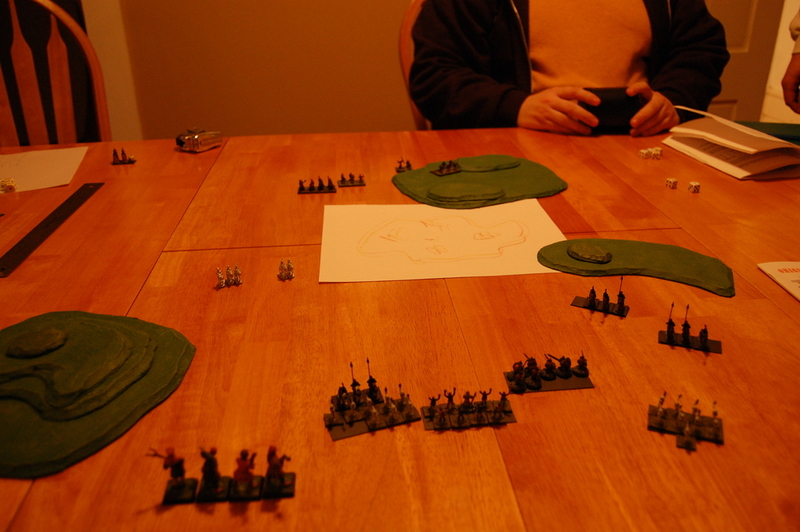 The light cavalry has impacted into my goblin archers on the left, but they hold as well. My turn 2, and I rush the enemy. Perhaps it would have been wiser to hold back and keep firing missile weapons. My hope though was to get one hit in with my giants. Sure they need 6’s against the heavy cavalry, but with damage 2 hits just one hit will take out a model, and with only 3 models in the unit I’m hoping for a quick route. In fact, the dice are just not with me here, as I only take out one cavalry model on both fights on the right flank, and no routes there either. My goblins show their mettle taking down one of the light cavalry models and wounding another, and a lucky shot of the fireball wand takes out another heavy cavalry model. One remains, but he just refuses to run. Now the fight is starting to turn. On the right flank I’m just not getting the hits I need, and my green skins are starting to whither. 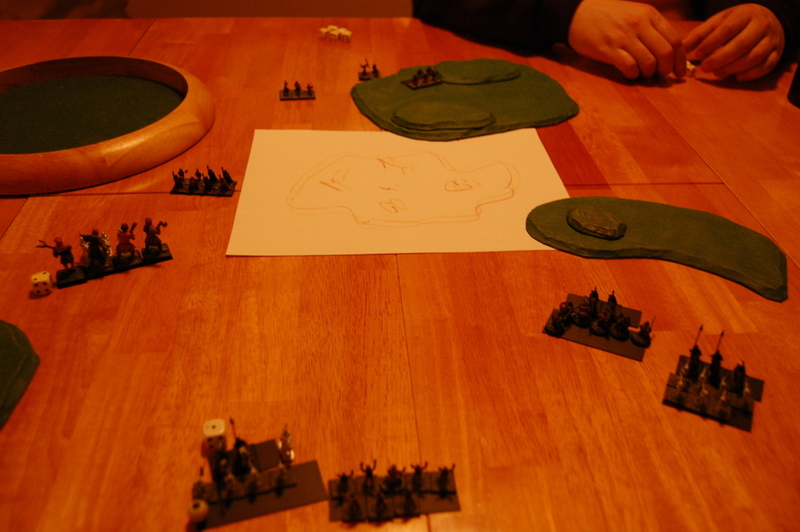 My wizard’s orcish guards have taken some losses from archers, but fortunately have not run. 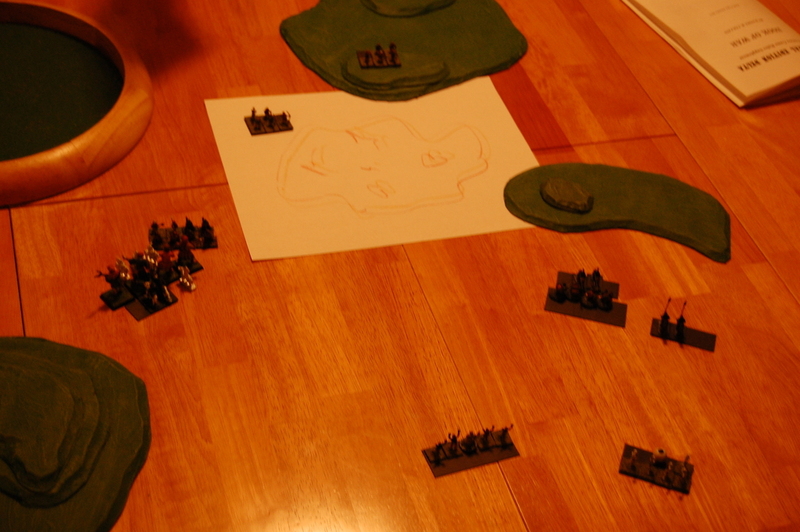 The solo heavy cavalry model has joined the light cavalry in wiping out my goblin archers on the left, and they route. My giants start taking a couple hits, though with 8 HD a piece, I’m not worried yet. My giants are now seriously under fire. There’s a full unit of 3 heavy cavalry in front, and 2 light and 1 heavy in the back. That’s 12 attacks! Not to mention the pikemen have joined in with some 1″ distant jabs at my poor giants. They’ve taken 6 wounds are look like they’ll lose a model soon. Most distressing though is their continued inability to inflict a single wound on the enemy! My wizards’ guards continue to take losses, and the battles on the right flank are really getting bloody. I’m losing models left and right, while my own attacks just never seem to land. This is the last turn we play, which is mine. My opponents unfortunately have to leave soon, and before I throw in the towel I want my last licks. Despite this, and despite shifting focus to attack the easier targets of light cavalry, the giants continue to roll terribly and miss every attack. My goblins on the right finally break, and my orcs are down to just 4 figures and keep missing their targets. The right flank was a pretty well balanced battle, but the dice just don’t love me in this game, and it looks like I’m going down. My wizard does land a fireball on some of the enemy wizard’s heavy infantry guards, but it’s too little to do any real harm. It’s too bad we didn’t get to finish out the fight, and I think my opponents’ are the pretty clear winners here. It was a lot of fun though, and definitely served the purpose of getting us all comfortable with the rules. I came away with a list of questions for Delta, which I’d normally just email, but as Book of War is an officially published product perhaps it serves us all better to post them publicly here. I’m sure Delta won’t mind, right? 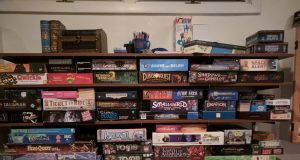 How close to the edge of the board should starting units be placed? When do routed units make their first move? If it’s during the controlling player’s turn, can he choose to move his regular units first to get them out of the way of the fleeing units to avoid the panic they might cause? I see you have moved the extra rank bonus to morale into the optional rules section — do you use that rule yourself? Do horse archers get the same extra attack other cavalry units recieve (suspect the answer here is yes)? Do only models in base contact get to fight? Does corner contact count? 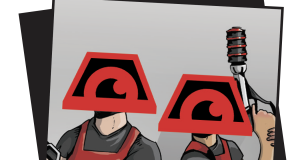 Say a unit 8 files wide attacks a unit only 3 files wide, how many attacks does he make? What happens when a unit with an embedded wizard has to make a morale check and they fail? Does the wizard flee with the rest of the unit? What about his personal entourage? Can a wizard’s wand be used when his unit is engaged in melee? Can he cast spells while in melee? Wow, OK, that was longer than I anticipated. Delta, if you don’t want to answer these here, I’ll be happy to move this to a more private venue. Responses: (a) Looks awesome!! (b) Ah, crap, you’re giving the players practice (I’m not that great a player, ha). (c) It takes wild horses to get me to NOT answer questions! First of all: I think I see an oversight that would have made things better for your side. Using advanced creatures, you always get +1 to hit per 3HD (Core Rules p. 5, paragraph 5; and again Advanced Rules p. 10, paragraph 3). So hill giants get +2 to hit, and thus, for example, hit Heavy Cavalry on any roll of 4 or better. As intended, hill giants-vs-heavy cavalry is tremendously advantageous to the giants (95% win rate vs. equally-valued-units); archery is the best counter against them. >> How close to the edge of the board should starting units be placed? Basically, pick something nice for your table setup. Here, I use a 6″ swath on each side, which is one-sixth the table length, and also has a really obvious seam in the table to make it obvious. Something like that. Yes, that’s correct. J. Scott asked this pre-publication and as a result I updated the language on p. 9 to try to make that clearer: “… adding the unit *type’s* HD”, the “type” here being hill giants with their HD8. >> When do routed units make their first move? If it’s during the controlling player’s turn, can he choose to move his regular units first to get them out of the way of the fleeing units to avoid the panic they might cause? “Yes” to the second question. It occurs at the same time as any other move, with the same allowances, except for direction. It tends to be kind of rare that anyone actually runs into a friendly unit (at least the way we play). Noted that sometimes new players do want to turn around a unit as soon as the rout is indicated, but that needs to be corrected; just flag it with a marker and pay for the about-face/move at the usual time. >> I see you have moved the extra rank bonus to morale into the optional rules section — do you use that rule yourself? I’ve gotten into the habit of either playing “Basic rules only” (so not in that case) or “Advanced rules with optional weather & morale” (so yes in that case). For example, the optional weather & morale rules were included in price-balancing the elves, orcs, etc. in the Advanced rules (esp. Light-Weakness, Alignment, and Ranks), so I do prefer to trigger that section when using the fantasy creatures. Ranks got moved to the optional section because I felt like 3 terms was enough for a new player to learn (dice + HD + R/L); I was forgetting Ranks myself a lot, but when I call out “Optional morale in play”, then I remember it. For what that’s worth. >> Do horse archers get the same extra attack other cavalry units recieve (suspect the answer here is yes)? Yes, that’s right. You could maybe argue that’s not great for historical purposes, but for simplicity I wanted it to work the same. >> Do only models in base contact get to fight? Does corner contact count? Say a unit 8 files wide attacks a unit only 3 files wide, how many attacks does he make? Only models in base contact, and corner contact does *not* count. That’s an important issue: whereas that would make sense in a 1:1 scale game like WarHammer, it doesn’t make sense in 1:10 scale BOW, where most of the men in the figure aren’t really within reach. On the “how many attacks” question, that’s variable depending on movement. (See Wrapping Movement on p. 9.) If the big unit just barely made contact at the end of a move, then maybe just 3 or 4 are in contact for attacks. If it had extra movement, then it could wheel the wings around the flanks and maybe get all 8 in contact. >> What happens when a unit with an embedded wizard has to make a morale check and they fail? Does the wizard flee with the rest of the unit? What about his personal entourage? >> Can a wizard’s wand be used when his unit is engaged in melee? Can he cast spells while in melee? Yes, but if he’s in “special combat” against a hero, then only that hero can be the target (p. 16, Targeting Spells). That ruling’s just a bit iffy, and I’m open to other interpretations depending on the D&D variant being played. On the plus side, I think you may have a couple converts as a result. Certainly you’ll likely make a few LuLu sales at least. > Only models in base contact, and corner contact does *not* count. I’ll just point out that this does beg the question: should all bases be the same size? I suspect you’re probably using GW bases, which means cavalry bases are slightly wider than infantry bases (25 mm vs. 20 mm). Also, what about stuff like large monsters (giants, dragons, etc.)? Of course, introducing new players to the game is just simply the best! I showed it to the teenaged friends of a business acquaintance here in NY, and a few weeks later we got a text that they were playing it in the basement that weekend with other friends. That rocks. I do assume that they base sizes differ, generally in accordance with Warhammer, Swords & Spells, and Battlesystem (which are all quasi-around the same size without being identical; I wanted to allow usage with any of them without re-basing). You’re right about cavalry, that actually is explicated as 1″~25mm in BOW (p. 5: Core Rules, paragraph 2). Honestly what I do for other stuff here is look at Swords & Spells and bump everything up by 1 class size (matching more modern stuff). 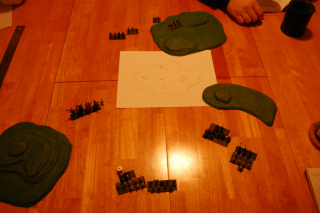 Examples: I run with gnolls/wolves at 1″ wide, bugbears at 1.25″, ogres/trolls/giants at 1.5″. For absolute specifics you can dig into BookOfWar.java and you’ll see what the assumptions are in the constructors. Interesting. 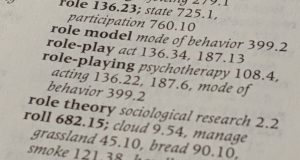 Do you think it breaks things when models don’t follow that ratio? 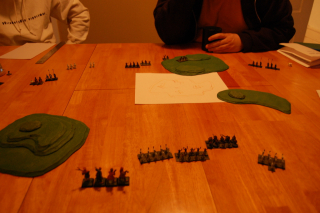 For example, on my 10 mm models the cavalry models use the same width base as the infantry (1/2″). The cavalry bases are just longer. The “giant” models I was using were standard 30mm models on 3/4″ bases, which is perhaps a bit small compared to what you’re using (3/4″ for infanntry and double that to 1.5″ for giants). PS: The .zip link on your blog post returns a 404. And: Fixed the blog link, thank you!